Pictured above: Jane Hervey (#BossBabesATX) and Lisa Wang (CThrough) were paired together for three days of business mentorship at Red Bull Launch Institute. Considering a mentor to help you get a boost in your entrepreneurial career? Take some tips from the mentors who attended Red Bull Launch Institute at South by Southwest Interactive Festival. 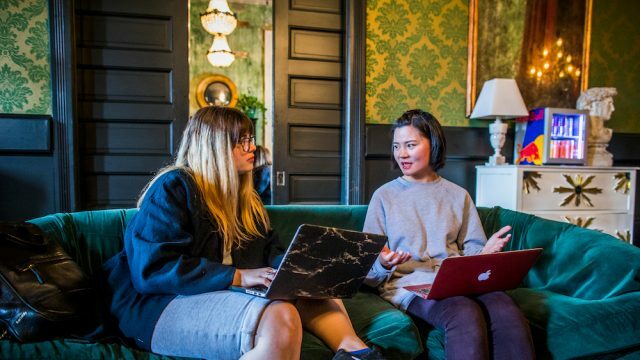 Red Bull Launch Institute Mentors Christiana Yebra, founder of Currency Dallas, and Lisa Wang, founder and CEO of SheWorx, say it’s important to find someone who is in a similar field that can share the lessons they learned from their mistakes and failures. There is no reason a young entrepreneur should have to experience the same mistakes as their mentor. Find a mentor that believes in your vision because not every mentor is right for every mentee, Wang said. Many times, startup entrepreneurship is based on the foundations of relationships one has established. “If you can find the right mentor, they’re usually well-connected so the people that you’re trying to get in touch with… they can provide an introduction… which is everything,” says Isis Ashford, cofounder and COO of Xplosion. Starting a company is a complicated and time-consuming process. “Mentors understand the mental processes you’re going through — desperation, sometimes frustration or fear. They’ve experienced it, and they can share those feelings and make you feel as if you’re part of a team,” says Paco Kuhlmann, cofounder and CEO of Altruus. The knowledge gained from a relationship with a mentor is invaluable. Dayana Hansley’s mentor, Steven Dourmashkin, cofounder of Specdrums, learned the ropes of consumer electronics prototype manufacturing on his own. Now in his same place, Hansley can skip a lot of the time spent learning about the world of product prototype manufacturing and get to the business of sales and production for her product, Motley Tool. Red Bull Launch Institute gives wings to collegiate entrepreneurs and their ideas. During three days at South by Southwest Interactive Festival, six teams of college students cultivated their innovative business concepts into reality under the mentorship of industry leaders and fellow entrepreneurs. At Red Bull Launch Institute, students learn during dynamic panel discussions, network and engage in individual team work with dedicated mentors to advance their business plans with the goal of achieving entrepreneurial success.